Ariel Venice watercolour is an unusual viewpoint for Trevor. Sketched and painted in watercolour with no preliminary line drawing. 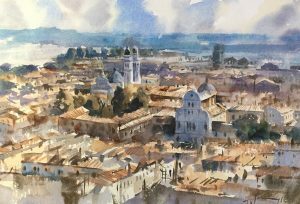 A loosely rendered impression looking over rooftops towards the lagoons of Venice. 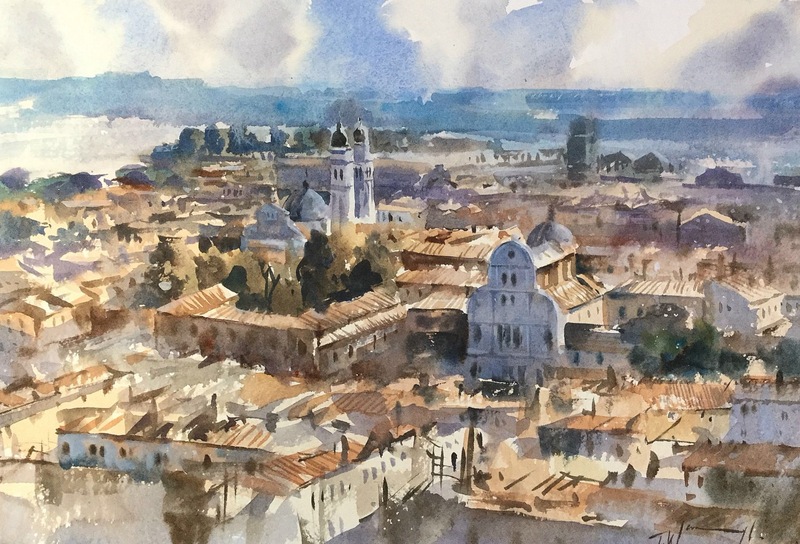 The scene shows an atmospheric elevated view with cool cloud formations hanging over the Isles of Venice and warmer, sun struck buildings in the foreground emphasising the ariel quality of it’s title. The salient points of reference have been adhered to but individual buildings and houses are lost in the mix for reasons of compositional conformity. An organic and impressionistic piece.